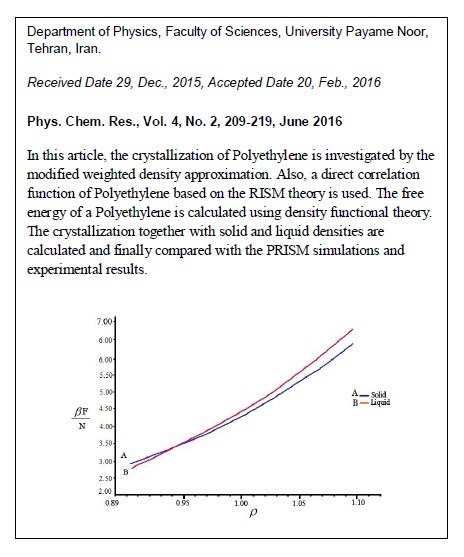 In this article, the crystallization of polyethylene is investigated by the modified weighted density approximation. Also, a direct correlation function of polyethylene based on the RISM theory is used. The free energy of a polyethylene is calculated using the density functional theory. The crystallization and also the solid and liquid densities of polyethylene are calculated and compared with the PRISM simulations and experimental results. It is shown that the results obtained by modified weighted density approximation (MWDA) are in a better agreement with the experimental results rather than the PRISM simulations.